I have a weird allergy called "Dermatography" or "Skin Writing Allergy" where the skin welts up from contact. The object used to write on the skin does not even have to be sharp or applied with much force. 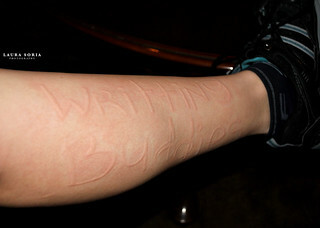 The writing on my leg was done gently with the blunt end of a color pencil. It is not painful, it just gets really itchy!! as if you were having lots of mosquito bites while it is welting :P Only about 4% of the population have it ;) In my case... it only lasts about 30 minutes and then it is totally gone..